Julia Kitchen Cart brings a modern style to your kitchen with a granite top which is easy to clean and also provides many uses. Below the drawer is a slide out metal basket, a removable serving tray, and a fixed bottom shelf. The whole unit sits on casters for easy maneuverability. 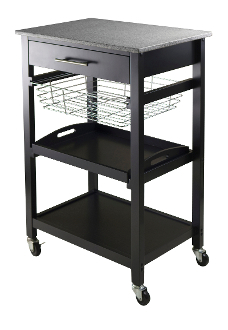 Overall cart size is 22.6"W x 16"D x 34.1"H. Granite top size 22.6"W x 15.75"D. Inside drawer is 17.8"W x 12.4"D x 2.4"H. Foldable wire basket is 15.9"W top x 13.1"D x 4"H. Removable tray is 17.25"W x 12.5"D x 1.2"H. Black finish. Assembly required. Overall cart size is 22.6"W x 16"D x 34.1"H. Granite top size 22.6"W x 15.75"D.
Inside drawer is 17.8"W x 12.4"D x 2.4"H. Foldable metal basket is 15.9"W x 13.1"D x 4"H.
Removable tray is 17.2"W x 12.5"D x 1.2"H. Black finish. Assembly required.